UPDATE: David Kilfoil and the Daily Gleaner have their take on the game. The University of New Brunswick Varsity Reds needed overtime, but ultimately prevailed 3-2 over a much improved Dalhousie Tigers team in front of a sold-out crowd of 3650 on "Northside Elementary School Night." The victory was UNB's 10th consecutive at home versus the Tigers and capped a successful weekend in which they moved back into sole possession of first place. For the second straight game the V-Reds came out strong and struck for an early goal when Tyler Carroll fed Shayne Wiebe, who fluttered the puck past Tiger goalie Wendall Vye at 4:50. Chris Culligan also picked up an assist on the play. This was the only goal in the period as UNB held a 11-3 shot advantage after twenty minutes of play. The second period was fairly uneventful until Dalhousie got a late power play. Former Saint Mary's defenceman David MacDonald would tie the game at 17:13 when he ripped a shot from in between the top of the face-off circles that eluded UNB goalie Travis Fullerton, who was making his second consecutive start. Shots in the period were 8 apiece. The third period was much more entertaining. The V-Reds took a 2-1 lead only 1:19 into the frame when Jonathan Harty got the puck at the blueline after a Culligan face-off win and had his shot towards the net tipped by Carroll and past Vye to bring the sell-out crowd to its feet. The lead was short-lived, however, as the Tigers received a long 5-on-3 and cashed in when Brendon MacDonald swept a loose puck into a wide open net after Fullerton made the initial save. The goal came only 95 seconds after the Varsity Reds took the lead. UNB would regroup and kill off the 5-on-4 to keep the game deadlocked at two. Both teams traded great chances for the remainder of the period, including Fullerton making a big glove save on a Tiger 3 on 1 rush and Carroll hitting the crossbar, but nothing would be decided and the game headed to overtime. UNB outshot Dalhousie 8 to 2 in the 3rd period. In overtime the Varsity Reds received an early power play after Chris Culligan was hauled down just inside the Tigers zone. The V-Reds put five shots on net during the man-advantage but couldn't beat Vye, who stood tall to keep the game tied. UNB would keep up the pressure and were finally rewarded at 3:09 when Carroll (Stamler, Salituro) collected his own rebound and took a bad angle shot from close to the goal line that somehow got behind the Tiger goaltender, giving the Varsity Reds an important 3-2 victory. Shots in the extra frame were 7-0 for UNB and shots in the game were 34-13. UNB was 0 for 5 on the power play while Dalhousie was 2 for 5. 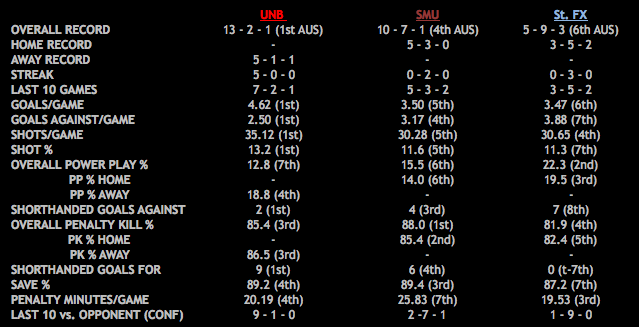 UNB had the edge in faceoffs, 36-28. Tyler Carroll, Travis Fullerton, and Wendall Vye were the three stars of the game. Stefan Salituro was back in the lineup, replacing Jordan Clendenning. Ben Wright, Josh Kidd, Chad Denny, Taylor MacDougall, Jeff Lee, and Luke Lynes all remained out. UNB hits the road next weekend for a rematch with both of this weekend's opponents. They play at Acadia on Friday night and at Dalhousie on Saturday. Elsewhere in the AUS tonight: Saint Mary's defeated St. Thomas 3-2 in OT, UPEI beat Dalhousie 4-2, and Moncton got by St. FX 2-1. Tomorrow night sees Dalhousie visit UNB, Acadia travel to UPEI, St. FX host STU, and Moncton play at Saint Mary's. UPDATE: The Guardian has a story on the UPEI/Dal game, STUTOMMIES.COM has the STU/SMU details, Hockeyscene.com has the UdeM/St. FX story, and the Chronicle Herald has a brief write up on all of the night's games. In a game between the top two teams in the AUS the University of New Brunswick Varsity Reds played maybe their best game of the season tonight, defeating the Acadia Axemen 7-1 before 2750 fans at the AUC. The victory was UNB's 17 consecutive at home against Acadia and moved the V-Reds into a tie with Moncton for top spot in the conference. The Varsity Reds came out with lots of energy and were quickly rewarded when Daine Todd (Carroll, Wudrick), from below the goal line, banked a shot off of an Acadia defenceman and past net-minder Evan Mosher at 2:16. UNB kept up their play for the remainder of the period and extended their lead on a goal by Antoine Houde-Caron (Fillier, Culligan), who picked up a loose puck during a scramble in front of the net and scored just before time expired in the period. Shots favoured UNB 13-6 in the period. The second period was much of the same for UNB as they continued to take the play to a depleted Axemen team, who are missing several regulars due to injury. Tyler Carroll (Nesbitt, Culligan) would make it 3-0 at 8:34 with a power play goal from the faceoff circle to the right of Mosher and almost scored another when he was stopped on a breakaway while shorthanded. The Axemen quickly turned the puck up the ice and got on the board with a power play goal of their own, by AUS leading scorer Andrew Clark (Owens) at 11:45 of the period. The momentum was short-lived, however, as Kyle Bailey (Nesbitt, MacNeil) restored the three goal lead only 27 seconds later. There was no more scoring in the period as UNB outshot Acadia 16-5. The V-Reds would put the game away in the 3rd period with three more goals - Thomas Nesbitt (MacNeil, Culligan) at 2:18, Bailey (Wiebe, Culligan) with his second of the game on the power play at 11:07, and Geordie Wudrick (Harty, Shutron) at 15:11. Shot were 14-3 for UNB in the period and 43-14 overall. Travis Fullerton made his return to the UNB crease and, while not tested often, looked sharp when had to be. UNB went 2 for 6 on the power play while Acadia was 1 for 6. Faceoffs favoured the V-Reds 50-28. Chris Culligan (4 assists) was named 1st star of the game. Kyle Bailey (2 goals) and Thomas Nesbitt (1 goal, 2 assists) were 2nd and 3rd stars, respectively. Carroll, Fullerton, Dan LaCosta and Shayne Wiebe all returned to the lineup while Ben Wright, Josh Kidd, Taylor MacDougall, Chad Denny, Jeff Lee, Stefan Salituro, and Luke Lynes were out. As part of UNB's Think Pink Campaign two lucky fans got the chance to shave defenceman Jonathan Harty's hair, which he has been growing out for almost a year, after the game in an effort to raise money for breast cancer. The V-Reds are back in action tomorrow night when the Dalhousie Tigers visit the AUC. Game time is set for 7pm. Please note that it is 'Elementary School Night' and the game will be general admission seating (reserved seats will not be honoured), so we recommend arriving a little earlier than usual to ensure you can get your reserved seats. David Kilfoil has the complete game story here. According to the AUC box office tonight's game between the visiting Acadia Axemen and the UNB Varsity Reds is a go, despite the weather. So come on out and cheer on the V-Reds as they look to reclaim first place. As the 2012 Cavendish Farms University Cup presented by the Home Depot draws closer it has been announced by the host committee that the Hockey Hall of Fame will be setting up an exhibit in the South Gym during this year's tournament, as a way to celebrate 50 years of CIS hockey. Included in the exhibit will be displays of hockey legends, two major NHL trophies, five interactive games, and hopefully some memorabilia. Entry will be free of charge. Also announced today were the times for the tournament games. The first game is scheduled for 2pm on Thursday, March 22nd with the host UNB Varsity Reds taking the ice for their first game after the opening ceremonies at 7pm that night. Friday's games will also be played at 2pm and 7pm while Saturday's start times are 11:30am and 4:30 pm. Sunday's championship game will begin at 8pm. All times are AST. This weekend the AUS#2/CIS#3 ranked University of New Brunswick Varsity Reds welcome the AUS #1/CIS#5 Acadia Axemen (15 -6-1) and AUS #7 Dalhousie Tigers (6-13-2) to the AUC on Friday and Saturday night, respectively, for two games that will go a long way in helping sort out the crowded AUS playoff picture. Both games are scheduled to begin at 7PM and Friday’s game against the Axemen is not only a battle for first place but, more importantly, will be the 2nd Annual ‘Pink In The Rink’ which helps support the fight against breast cancer. 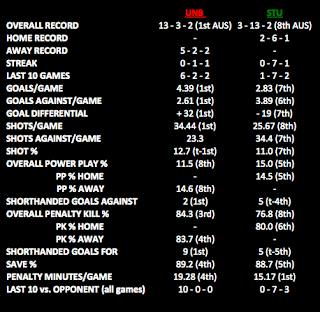 A breakdown of the head to head stats of these teams can be found below. The V-Reds look to rebound from a tough week in which they went 1-2 and fell out of first place in both the AUS and CIS national rankings. Despite their recent struggles UNB still leads the conference in a number of categories, including goals/game (4.38), goals against/game (2.90), shots/game (35.29), shots against/game (23.7), faceoff percentage (56.1), and shorthanded goals (11). They are lead in scoring by Kyle Bailey (26 points), Chris Culligan (22), and Luke Gallant (21). The Axemen have won their last four games to move into sole possession of first place in the AUS. In two prior meetings this season the teams have split. UNB won 3-0 at the AUC in October while Acadia returned the favour two weeks later, defeating UNB 6-5 in a shootout in Wolfville. Acadia currently leads the conference in penalty killing and sit in the upper half of most other important categories. They are lead by Andrew Clark (an AUS leading 35 points), Christopher Owens (27), and Liam Heelis (20). The Tigers struggled to begin the season, going 2-11-1 in the first half. However, they have rebounded to win 4 of their first 7 games of the second half, thanks in large part to a coaching change and players returning from injuries. This has moved them up to 7th in the conference, only one point behind St. FX for the 6th and final playoff spot. UNB has won 18 of their last 19 against Dalhousie, including both meetings between the teams this season – 10-1 at the AUC in late October and 9-2 in Halifax two weeks later. The Tigers are led in scoring by Benjamin Breault (23 points), former SMU defenceman David MacDonald (17), and Pier-Alexandre Vandall (15). If you cannot make it the AUC this weekend both games will be webcast here. You can also follow UNBHockey via Twitter here. The University of New Brunswick Varsity Reds men's hockey team will be holding their 2nd annual "Pink In The Rink" tomorrow night at the AUC against the 1st place Acadia Axemen. Game time is 7pm. This is the beginning of UNB's Think Pink campaign, which raises awareness and money for the fight against breast cancer. After the game V-Reds defenceman Jonathan Harty will be shaving his head to support the cause. Click here for more details, including how you can help out via donations or buying pink-themed merchandise. Everyone come out and support the V-Reds and, more importantly, a great cause! * Other teams receiving votes: Lakehead (13), UPEI (7), UBC (2). * Western Ontario (over UNB) and Saint Mary’s (over Lakehead) were awarded the higher ranking based on number of higher-placed votes. The Chronicle Herald previews the crucial home-and-home matchup between SMU and Dalhousie. The Tigers sit only three points out of the final playoff spot. Boxscore News previews the UdeM/UNB game, with quotes from Moncton coach Serge Bourgeois about their upcoming games against UNB and STU. Of note is word that goaltender Pierre-Alexandre Marion is doubtful for both games. The AUS Pool has been updated. Once again Drummer leads the pack with 207 points. For most of the year it's looked as if Drummer was going to sail on to bragging rights...but last year's champion, AUS Fan, has made a mid-season charge and rests just 4 points back of the lead. This week's top performer was Seafoam with 20 points. The top 10 performers are listed below and the complete results can be viewed at the AUS Pool Page. "UNB Hands STU a 5-1 Defeat" from Bryannah James at The Brunswickan. "UNB Power Play Clicks Big Time" from the UNB Athletics website, courtesy David Kilfoil . "Bailey Breaks Sticks, And STU Hearts" from Bruce Haillihan at the Daily Gleaner. The Brunswickan's Bryannah James recently talked to UNB's newest player, former St. John's Ice Cap and Brandon, Manitoba native, Shayne Wiebe. Among the topics discussed are what led him to choosing to play hockey as a young boy, his WHL career, his time in St. John's, and why he decided to come to UNB. 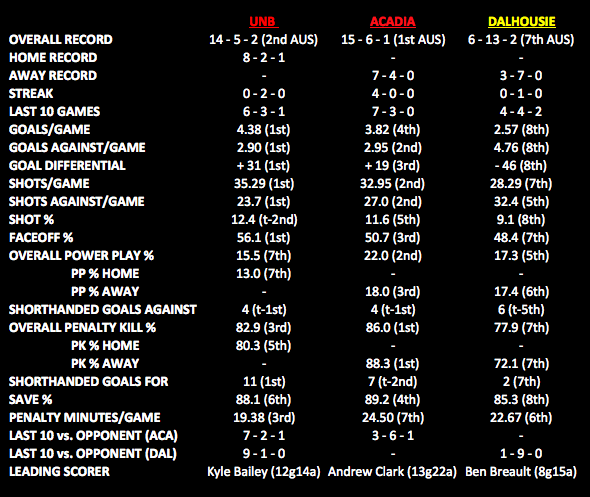 Elsewhere in the AUS tonight: Acadia squeaked past Dalhousie 3-2 in OT and Moncton beat UPEI 4-2. The standings look like this after tonight's results: UNB - 30 points (19 games), Acadia - 27 (20), Moncton - 26 (19), Saint Mary's - 25 (20), UPEI - 22 (19), St. FX - 15 (19), Dalhousie - 12 (15), and STU - 8 (15). The Chronicle Herald has a brief write up on all of the night's games. The Journal Pioneer and Guardian both have a story on the UPEI/UdeM game, a game which didn't sit well with UPEI coaches. The University of New Brunswick used 4 power play goals to defeat the St. Thomas Tommies 5-1 at the LBR tonight in the 18th annual Lou Chabot Memorial Game. The win was UNB's 30th straight over STU. The first period began slowly as neither team could muster many shots on goaltenders Dan LaCosta and Charles Lavigne. UNB was finally able to break through with one second left on their second PP when Chris Culligan broke in to the STU zone on a two on one and elected to shoot, putting it off the post and behind the STU net-minder. Geordie Wudrick and Marc-Antoine Desnoyers picked up assists on the play. This was the only goal of the period that seen UNB outshoot the Tommies 11-5. The V-Reds were able to expand their lead in the second period. 5th year Captain Kyle Bailey (Culligan, Luke Gallant) made it 2-0, also on the PP, when he fired a shot from the blue line that made its way through a Jonathan Harty screen in front and beat Lavigne. About 7 minutes later Shayne Wiebe took a pass from Nick MacNeil, raced down the left side, and passed it through the slot to Bretton Stamler, who hammered the puck into the back of the net to make it 3-0. Shot were 17-6 for UNB in the period. Unfortunately for STU there was no miraculous 3-0 third period comeback on this night, despite the Tommies pressing hard and playing their best period of the night. The Tommies made it a two goal game (Cameron from Cheremetiev and Morehouse) and Lavigne made a couple of larcenous saves on an extended V-Reds 5 on 3 to give his team some hope, but UNB would get another 5 on 3 late in the game and salted it away with goals on both ends of the two-man advantage. Bailey picked up his second of the game at 18:38 after a nice passing play involving Gallant and Culligan. Bretton Stamler (Harty, MacDougall) rounded out the scoring only 18 seconds later with his second of the game when his shot dribbled through Lavigne and into the STU net. Shots favoured UNB 13-12 in the period and 41-23 for the game. UNB finished 4 for 8 on the power play while STU was 0 for 4. Face-offs were 47-36 for UNB. Player of the game was Chris Culligan (1 goal, 2 assists). UNB is back in action on Friday when they travel to Moncton for an important game against les Aigles Bleus. Tonight, your CIS #1 ranked V-Reds travel down the hill to take on the AUS 8th place STU Tommies at 7pm at the LBR. Last Meeting – On December 2nd, the V-Reds hosted the Tommies for the 175st Battle of the Hill in front of 3123 fans on a night that saw the V-Reds pull out a 3-2 OT victory on a goal by Bretton Stamler at 1:54 of the extra frame. The final shots for the game were 42-17 in favor of the V-Reds. Stamler had 2 goals on the night, while Daine Todd scored the other. Number 8 hosts number 1 – The Tommies (3-13-2) host the V-Reds (13-3-2) for the 18th annual Lou Chabot Memorial game and the 176nd Battle of the Hill at 7pm tonight at the LBR. The Tommies are currently on an eight games losing streak and sit last in the AUS. The V-Reds are on a two game losing streak and sit both first in the AUS and first in the CIS in the latest media poll. - UNB is currently on a 29 game winning streak over STU. - The last time STU beat UNB at the LBR was February 10th, 2006 (150th Battle of the Hill), the 12th annual Lou Chabot Memorial Game. The score that night was 10-3 for STU. Who to Watch for on STU – Stephen Sanza (2G 1A) is tied with Randy Cameron (3A) for most points against the V-Reds this year. Who to Watch for on UNB – Bretton Stamler (2G 1A) and Jonathon Harty (2G) have accounted for half of the goals the V-Reds have had against the Tommies this year. The V-Reds defense has been stifling this season, only allowing the Tommies 34 shots in the two games. For those of you who cannot make it out to the game, it can be viewed as a webcast and you can follow the updates on UNBHockey on Twitter. The V-Reds held onto #1 in the latest media poll, despite losing both their games this past weekend. The V-Reds took nine first place votes, five less than last week. The McGill Redmen (16-2-2) took six first place votes, while the Saskatchewan Huskies (15-3-2) took the remaining two votes. For the first time this season, four AUS teams were voted into the top ten: Acadia (12-6-1) was #6, Moncton (12-6-0) was #7, and Saint Mary’s (12-7-1) was #10. The full top ten is below. Other teams receiving votes: UQTR (24). The complete article can be found here. Elsewhere in the AUS tonight: Dalhousie upset Moncton 5-1, St. Mary's beat UPEI 5-3, and Acadia defeated St. Thomas 3-1. After this weekend's results the standings have tightened up further. UNB still leads the way with 28 points (in 18 games) while there is a logjam from 2nd to 5th. St. Marys (25 points in 20 games), Acadia (25 in 19), Moncton (24 in 18), and UPEI (22 in 18) all remain within striking distance of the top spot but, probably more importantly, are well positioned to grab the 2nd place spot and the all important 1st round playoff bye that comes with it. St. FX's much needed win leaves them in 6th with 15 points (in 18 games). Dalhousie (11 points in 18 games) and STU (8 in 18) remain on the outside looking in. The next AUS action is this Wednesday when STU hosts UNB, Acadia visits Dalhousie, and Moncton travels to UPEI. The UNB Varsity Reds rallied from a three goal second period deficit before falling 5-4 in a shootout to the St. FX X-Men Saturday night in Antigonish. The X-Men got off to a quick start and took a 1-0 lead thanks to a Michael Kirkpatrick (Bast, McAvoy) powerplay goal just over two minutes in. UNB was able to tie it up after a beautiful individual effort by Shayne Wiebe (Culligan, Desnoyers), who eluded a defenceman and beat X goalie Joey Perricone for his first career CIS goal. St. FX restored their lead just over three minutes later, again on the power play, when a Jason Bast point shot deflected in front and Kirkpatrick banged home the rebound for his second goal of the game. Shots in the first period favoured UNB 7-6. The second period did not start out well for the V-Reds as St. FX took advantage of some fortunate plays to take a 4 - 1 lead. First, Stephen Simms collected a pass from Jarred Struthers just as he was coming out of the penalty box and beat Dan LaCosta on a bad angle shot that may have surprised the UNB goaltender. This was followed by a Gabriel O'Connor (Morrison, MacLellan) point shot that deflected off of a UNB player in front and into the top corner. This prompted UNB head coach Gardiner MacDougall to call a timeout. The strategy seemed to pay off as Chad Denny pulled UNB within two goals at 14:47 of the period with a blast from the blue line off of a Tayler MaDougall faceoff win to the right of Perricone. Bretton Stamler also picked up an assist on the play. UNB would get the equalizer with 11 seconds left in the period on almost the exact same play, only this time it was Stamler who benefited from a Kyle Bailey face-off victory. Shots in the second period were 13-10 for UNB. The V-Reds came out strong in the third period and were finally rewarded with the game tying goal at 13:14 after a good shift forced the X-Men to start running around in their own zone. Luke Gallant received the puck from Chris Culligan, faked a shot from the point, and found Wiebe at the side of the net, who put it past an out of position Perricone for his second goal of the night. UNB out-shot the X-Men 11-9 in the third period. There was no scoring in overtime as UNB was forced to kill off two penalties back to back. Shots were 6-4 for X in OT and 35-31 for UNB overall in the game. In the shootout Michael Kirkpatrick and Kevin Undershute were able to solve LaCosta after Jason Bast was stopped on X's first try. Kyle Bailey and Thomas Nesbitt were unable to beat Perricone. UNB will try to rebound from a 0-1-1 weekend on Wednesday when they head to the LBR to face the St. Thomas Tommies in another edition of the "Battle of the Hill". Click here to read the game story from the St. FX Athletics site. The V-Reds were defeated 2-1 by the SMU Huskies on Friday night. Chris Culligan scored the lone goal for UNB, who were outshot 27-25 by SMU. Dan Lacosta was in goal for UNB and was solid when called upon. The V-Reds will look to regroup for tomorrow night's game in Antigonish vs the StFX X-Men. This weekend, the CIS#1 ranked V-Reds travel to Nova Scotia to take on the AUS #4 St. Mary’s Huskies (10-7-1) tonight in Halifax, and then on to Antigonish on Saturday night to play the AUS #6 StFX X-Men (5-9-3). A breakdown of the head to head stats of these teams can be found below. The V-Reds are currently on a five game winning streak in regular season play, and will look to continue their winning ways this weekend. The V-Reds currently lead the AUS in Goals (74), Goals per Game (4.62) Assists (119), Points (193), Goals Against (2.50), Shots per Game (35.12), Shots Against (362), and Short-Handed Goals (9). The V-Reds are led in scoring by Kyle Bailey (10G 11A) and four other players tied at 15 points. The Huskies lost both of their games last weekend, and fell from 2nd to 4th in the AUS in the process. The Huskies and V-Reds have met each other three times this season, with the V-Reds coming out on top each time by scores of 3-1, 4-2, and 3-2. In those games the Huskies top scorers were Matt Tipoff (2G) and Cory Tanaka (1G 1A) while the V-Reds were led by Dion Campbell (1G 3A) and Kyle Bailey (2G 1A). The Huskies currently have the best Penalty kill in the AUS (.880) and are led in scoring by Cory Tanaka (5G 11A), Matt Tipoff (5G 11A), and Cam Fergus (4G 12A). The X-Men have lost their last three regular season games in a row and will look to rebound at home this weekend. The X-Men and V-Reds have met each other three times this season, with the V-Reds coming out on top each time by scores of 3-1, 7-6, and 5-2. In those games the X-Men's top scorers were Bryce Sawn (3G 1A) and Brett Morrison (1G 3A) while the V-Reds were led by Tyler Carroll (3G 2A) and Thomas Nesbitt (3G 2A). The X-Men currently have the second best Power-Play in the AUS (.223) and are led in scoring by Jason Bast (12G 9A), Bryce Swan (10G 10A), and Brett Morrison (6G 14A). The SMU game webcast can be found here, while the StFX game webcast can be found here. As always, the games can be followed on UNBHockey on Twitter. UPDATE: Apparently the game will be broadcast on CHSR 97.9 FM as well. Last month the Western Hockey League announced a list of 41 former players who achieved the honour of Academic All-Canadian during the 2010-11 season. The Varsity Reds had five players recognized for their excellence in the classroom - Forwards Kyle Bailey (Portland, Lethbridge) and Taylor Procyshen (Tri-City), and defencemen Ben Wright (Lethbridge), Bretton Stamler (Seattle, Edmonton, Swift Current), and Jonathan Harty (Everett). This total was more than all other AUS teams combined. It also placed UNB in a tie with the University of Alberta and the University of Saskatchewan for the most of any school. To achieve Academic All-Canadian status one must maintain a minimum grade point average of 80%, with a minimum of 18 credit hours while playing for a varsity team. Click here for the full list and accompanying article. In today's Daily Gleaner Bruce Hallihan gives us an update on former V-Reds Rob Hennigar and David Bowman, both of whom are playing for Sportivi Ghiaccio Cortina in the Italian league Serie A. Hennigar, the 2008 CIS male athlete of the year, currently leads the team with 42 points (15 goals, 27 assists) in 25 games. Meanwhile, Bowman has chipped in with 12 points (2 goals, 10 assists) in 26 games, which places him second on the club among defencemen. During Hennigar's four year CIS career he helped lead UNB to a National Championship (2007) and a runner-up finish (2008), while becoming the team's all-time leading scorer (which has since been broken by Hunter Tremblay). Bowman, who played three seasons for UNB, won a CIS Gold in both 2007 and 2009, while capturing a CIS Silver in 2008. The full article can be accessed here (subscription required). Pool results are up and 2012 is starting just like 2011 ended...with Drummer leading the pack. Gamer and Islander were this week's top performers with a bountiful 25 pts. The Top 10 are listed below and the complete results can be viewed over at the AUS Pool page. Varsity Reds forward Thomas Nesbitt has been named the UNB/Valley Graphics male Athlete of the Week for his efforts over the weekend. The 1st year native of Ottawa was a key contributor in both of UNB’s wins. Nesbitt scored his 6th and 7th goals of the season and was a +3 in Friday’s 5-2 victory against the St. FX X-Men. On Saturday he collected an assist and was +2 in a 3-2 win over Saint Mary’s. The former Ottawa 67 has proven to be a welcome addition to the V-Reds roster this season as he currently sits second on the team, and fourth among all AUS rookies, with 15 points. The UNB release can be found here. The first media poll of the second half has been released, and the V-Reds have held onto their #1 position, collecting 14 of 17 possible #1 votes. McGill (15-2-1) got the other three #1 votes. This makes nine polls in a row this season the V-Reds have been voted #1, and 19 in a row over all. the V-Reds have topped 51 of the last 73 polls (.698) since 2006-07. Other teams representing the AUS were UdeM (11-5-0) in 6th and Acadia (11-5-1) in 8th. Moncton (over Lakehead) and Acadia (over Manitoba) were awarded the higher ranking based on number of higher-placed votes. Other teams receiving votes: Saint Mary’s (17), UPEI (3), Ottawa (1). The full article can be read here. Two of our current V-Reds are moving up through the leader boards in team history. Kyle Bailey currently sits tied for 6th all-time regular season in points, and sits alone in 6th for all-time career points. Luke Gallant sits in 2nd in all-time regular season points for defencemen, and in 5th in all-time career points for defencemen. Where do you think these two will end up placing at the end of the year? How would you rate Kyle Bailey compared to former captains? How about Gallant, where does he rate compared to former defencemen? To take a look at their current standings, check here. The first period saw the Huskies press hard, and they were rewarded at the 5:59 mark when Matt Tipoff took a nice feed from Cam Fergus to make it 1-0 with a short Handed goal. Shots after the first period were 13-10 in favor on the Huskies. The second period saw a lot of back and forth, but it was the V-Reds who would tie up the game at the 9:06 mark as Geordie Wudrick took a great pass from Thomas Nesbitt to beat Neil Conway. The V-Reds got into penalty trouble and had to kill off 1:30 of 5-3 in which they did not allow the Huskies a single shot. Shots in the second were 9-7 for the V-Reds. The third period saw the Huskies come out hard and they were rewarded on the power play at 3:11 as Colby Pridham connected with Cory Tanaka to beat LaCosta. At the 10:58 mark, Jonathan Harty tied it up with a great shot from inside the blueline. The Huskies took a penalty with 1:07 left, and it was Harty who fed Kyle Bailey at the 19:41 mark for the game winner. Attendance tonight was 2671, and the final shots were 38-34 for the V-Reds. The CIS #1 ranked V-Reds were back in mid season form tonight, topping the StFX X-Men in front of 2376 fans tonight at the AUC. Scoring for UNB were Thomas Nesbitt (2), Tyler Carroll, Antoine Houde-Caron, and Daine Todd. For the X-men it was Brett Morrison and Jarrad Struthers with a goal that many fans thought was a kick in. Shayne Weibe and Geordie Wudrick each picked up an assist in their first regular season games as V-Reds. Weibe had put a goal in earlier in the contest, but it was waived off as the referee decided it was a high stick, a call many fans disagreed with. Final shots were 28-25 for UNB. The V-Reds are back in action tomorrow night as they host the SMU Huskies at 7pm at the AUC; come on out and cheer on the V-Reds!! This weekend, the CIS #1 ranked V-Reds (11-2-1) host a pair of games on Friday and Saturday night. Tonight, the V-Reds host the AUS #6 StFX X-men (5-7-3) at 7pm at the AUC, and the CIS #6 ranked SMU Huskies (10-5-1) visit the AUC on Saturday night at 7pm. The V-Reds are currently on a three game regular season winning streak, and a five game winning streak if you count the two exhibition victories over the Ottawa GeeGees over the Christmas break. The V-Reds have welcomed two new players since the end of the first term, with Geordie Wudrick and Shayne Wiebe now eligible to play for second half. There has been a lot of speculation as to how the lines will look, but we will have to wait until game time Friday night to find out. The V-Reds are led in scoring by Kyle Bailey (9G 10A) and Luke Gallant (3G 12A). The X-Men lost their last game of the first half to SMU, and split a pair of exhibition games over the Christmas break, including a 4-0 shutout loss to the Acadia Axemen (9-5-1) earlier this week. That being said, the X-men will look to start the second half with a big win over the V-Reds. These two teams have met twice this season with the V-Reds coming out on top 3-1 and 7-6 in those games. The X-Men are led in scoring by Bryce Swan (10G 10A) and Jason Bast (11G 8A). The Huskies sit in second place in the AUS, just 2 points back of the V-Reds, but have played two more games than the V-Reds. SMU finished the first half of the season on a three game winning streak, but dropped a shootout loss to the X-Men in exhibition play over the Christmas break. These two teams have met twice this season, with the V-Reds coming out on top 3-1 and 4-2 in those contests. The Huskies are lead in scoring by Cory Tanaka (3G 11A) and Cam Fergus (4G 9A). If you can't make it out to the games, you can view the webcast, watch it on Rogers TV, and as always, follow the updates on UNBHockey on Twitter. Today's Daily Gleaner is revealing what might be the worst-kept secret of the past week. Shayne Wiebe has joined the Varsity Reds as the latest recruit of the 2011-12 season. Shayne split his WHL career between the Kamloops Blazers and Brandon Wheat Kings. Last year in 72 games with Brandon, he scored 44 goals and put up 21 assists for a 65 points while serving as team captain. He spent the last few months with the St John's IceCaps of the AHL before deciding to pursue his education. Game 2 of the Pete Kelly Cup saw the V-Reds connect for 8 goals. Scoring for UNB were Antione Houde-Carron with a terrific 4-goal effort, Dion Campbell with 2 goals, Taylor MacDougall, and Chad Denny. Dan Lacosta was in net and made 19 saves for the victory. UNB opens the 2nd half of the AUS regular season vs. STFX on Friday and SMU on Saturday at the Aitken Centre.